PHUKET:-- A 21-year-old man was arrested attempting to smuggle 1,564 methamphetamine pills (ya bah) onto Phuket last night (Feb 8). The pills were en route to their delivery point – a government housing estate in Srisoonthorn. A team of Tha Chatchai Police officers led by Lt Col Taweesak Kampeera arrested Chakrit Petcharat, from Nakhon Sri Thammarat, at the Phuket Checkpoint during a routine search of a bus heading from Phang Nga to Phuket. 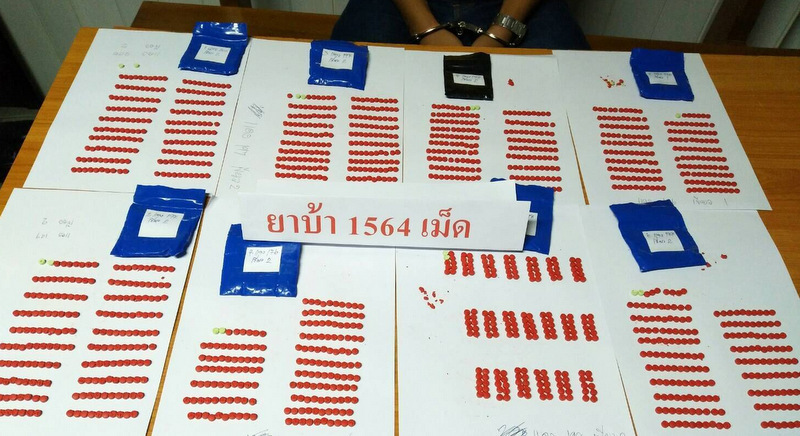 In making the arrest, police seized 1,564 ya bah pills that were found inside a bag that Chakrit has in his possession. Lovely job they did arranging them pills so neatly. I live here because I like to laugh! Idiots. They should have continued the journey and let the guy lead to the buyer. Overpaid boyscouts! Show catch of the month for the check point cops at Sarasin. This check point you can easily pass with a 10 wheeler full of drugs if you are not dumber as a bag of pebbles. so you rule out the possibility of the mule being set up? Set up also falls into the category show catch.